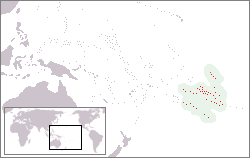 Tahiti on the World map, courtesy of Mixcoatl on Wikipedia. Small break from the Euros this, but something worth mentioning. I love an underdog story, and this certainly meets that criterion. When Australia left the Oceania confederation (OFC) to join the Asian (AFC), the assumption then was that New Zealand would dominate every OFC competition from that moment on. Nobody, it would seem, told our friends in the French Pacific colonies this before this year’s OFC Nations Cup. First off, New Caledonia (birthplace of Christian Karembeu, among others) beat New Zealand in the semi-finals. Then New Caledonia and Tahiti did battle in the final, with a goal from Steevy Chong Hue (who plays for a side in the Belgian Third Division) after 11 minutes being enough for a Tahitian victory. It is of course the consequences of this unlikely success that make it doubly interesting. At the 2013 Confederations Cup, Tahiti will line up against sides like Spain, Brazil and Uruguay – a colony (not even a country) with a population which is less than 0.1% that of Brazil’s at around 170,000 will face off against these footballing behemoths. No doubt they’ll get absolutely hammered in each match, but nonetheless it is an incredible achievement. Their passage to the final also puts them in with a chance of qualification for the main event (the World Cup) in 2014 – the four OFC semi-finalists (New Zealand, the Solomon Islands, New Caledonia and Tahiti) will face off between September 2012 and March 2013 for the chance to take that intercontinental play-off spot, this time against the fourth place team from the CONCACAF region (which last time round was Costa Rica). One assumes New Zealand will return to form, and they might argue that they were only interested in a semi-final berth to ensure a place in the final round of World Cup. However, it seems that, on this evidence at least (and the fact that New Zealand only won their bronze medal with a 4-3 win against the Solomon Islands), they might not be in for quite such an easy ride come qualification time. Football, it seems, can still be surprising, even where miniscule French colonies are concerned.